Canada's postal service celebrated its 150th Anniversary April 6, 2001. For more than 100 of those years the Railway Mail Service played a crucial role in the postal service. Mail was handled on trains from the earliest times, possibly as early as 1836 with the opening of the first railway, the tiny Champlain & St.Lawrence. The first proven train cancellation was October 22,1853 on the St.Lawrence & Atlantic between Montreal and Portland, Maine, following the opening of a 292 mile long route in July 1853. Postmaster General James Morris wrote the Governor General of British North America, August 12,1853, suggesting travelling post offices. The first one began January 1854 on the Great Western Railway between Niagara Falls and London, Ontario, which line was opened November 1, 1853. Mail was officially carried as early as 1693, the first official post office in Canada was opened in Halifax, Nova Scotia by Deputy Postmaster General Benjamin Franklin in 1755. (Yes, THAT Benjamin Franklin! He was at the time a British subject before turning against the King.) 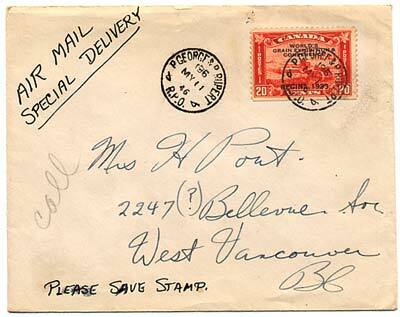 Control of the post office passed from the Imperial Parliament to the Province of Canada on April 6, 1851. The first postage stamp was the famous Three Pence Beaver, based on a sketch by none other than the famous, multi-talented Sir Sandford Fleming! Following Confederation (1867), the Post Office was created in 1868 as a department of the federal government. In its first year it handled nearly 22 million letters, 19 million newspapers and 39,000 parcels, a total of about 41 million pieces of mail, approximately the same volume as is handled in a single day now! 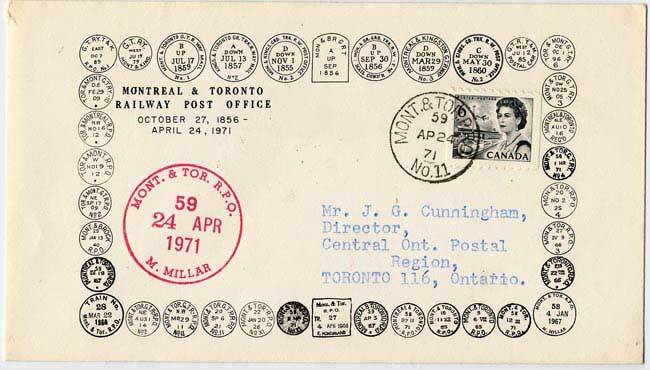 Canada Post Corp. was created as a crown corporation October 16,1981 to replace the Royal Mail. The Royal Mail displaying the Coat-of-Arms of the ruling Sovereign was a common sight everywhere in Canada and enjoyed special privileges. "The mail must go through", might as have well been the official motto for nothing was permitted to interfere with its journey. There is a true story of how this was tested in Ottawa one day where special streetcars were used to carry mail to and from the main post office. It seems the motorman was well aware of the Royal Mail authority and refused to stop for a procession. He was arrested but not convicted because "the mail must go through". In early times "Postal Conductors" accompanied mail, but this was soon changed to Railway Mail Clerks who actually sorted and cancelled the mail. (In later years as the volume of mail grew, only letters mailed at railway stations, and all Registered mail, was cancelled in the R.P.O. increasing the rarity of these cancels for stamp collectors). The travelling post offices the Postmaster General wanted became known as Railway Post Offices (R.PO. ), and were part of the Railway Mail Service. Sorting of mail en route saved time, and a network of these "travelling post offices" soon covered all of Canada. Railway Mail Clerks were the elite of the postal service, their training, knowledge and dexterity, all in cramped quarters that moved beneath their feet set them apart from all others. 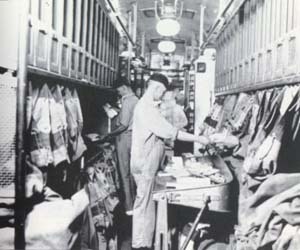 Mail was sorted to towns on route and connections to other trains, a very complex matter. Mail for cities was sorted right down to the Letter Carrier's walk. Busy R.P.O. runs involved men sorting one piece of mail every 2 seconds! The annual test involved a rigorous 1000 pieces in one hour! 90% accuracy was demanded. All classes of mail were handled by the Railway Mail Service, but not all of it was in R.P.O's, much was carried as 'through" mail in closed cars especially parcels. There was even a letter slot in the side of the mail car where letters could be posted at station stops! 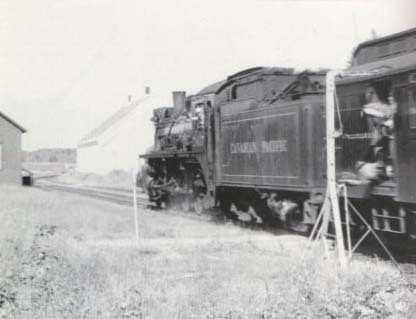 Regularly scheduled passenger trains were used to ensure dependable movement. Mail was picked up on the fly using a catch arm on the side of the car swung out by a Railway Mail Clerk who at the same time kicked off a sack of mail for that place. This was a tricky maneuver especially at night or in bad weather and with high speed. Although the engineer was supposed to slow up, if the train was running late and he was making up time, it was just theory. The engineer was to whistle the Mail Car approaching the pickup point, likely this was just the normal one long blast at one mile when approaching a station. Rules 31, and 14 (m) applied. Not much warning, less than a minute at 60 mph, which is a mile a minute. One thing's for sure, if the catch was missed, the train didn't stop! Mail Cars on the heaviest main line runs had 72-foot interiors staffed by up to 10 men, while others had a 60-foot interior, worked by 5 men. Secondary runs involved a Mail & Express car with a 30-foot mail section staffed by 3 men, the other 30 feet being for Express. The men lived on these cars for long runs and thus they were equipped with stoves, toilet, sink, cooking facilities etc. Men received a travel allowance (15 cents per mile in 1955), to cover their meals and hotel expenses. Parcel Post remained a very important aspect of the Postal Department involving huge volumes of mail including the extensive mail order catalogue business of the Eaton's and Simpsons department stores which allowed even the smallest community to promptly receive goods. Newspapers were long an important aspect of the Railway Mail Service, again to reach people in outlying rural areas. Perishables from farmers such as baby chicks, bees, eggs, etc. were also handled along with Registered mail that included money and gold! Even ballot boxes from Federal elections were carried by the Royal Mail. 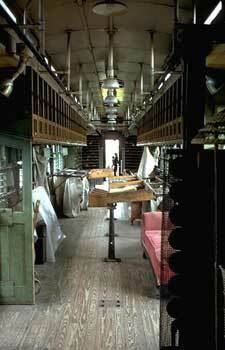 Access to the Mail Car was restricted to Postal employees, not even the train Conductor was permitted inside it. The system grew until in 1950 there were 192 R.P.O. 's staffed by 1,385 men, covering some 40,000 miles of route and 834 "through" cars. A national rail strike in 1950 (the first ever), gave trucks the mail and the Post Office saw the flexibility that permitted. It was all down hill from there on. Loss of the mail contract often resulted in discontinuance of passenger service, especially on branch lines. The last R.P.O. ended its run April 24, 1971 returning from Campbellton, New Brunswick to Levis, Quebec. 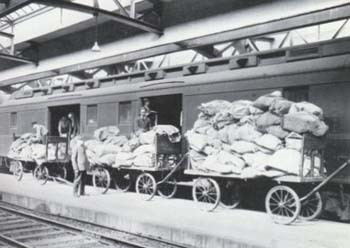 Mail was still carried by rail until 1987, when it was finally turned over entirely to trucks and planes. (The first official Airmail flight had taken place June 24, 1918 between Montreal and Toronto.) A very efficient system of delivering mail was lost with the ending of the Railway Mail Service and the R.P.O. Stamp collectors, known as philatelists, often specialize in certain areas one of which is "covers", the actual envelope and stamp. 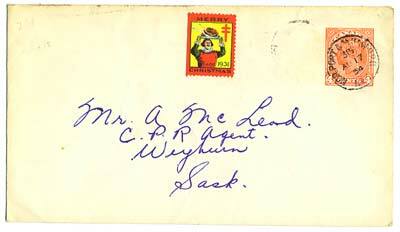 This is to preserve the cancellation, which indicates the date and place of mailing. 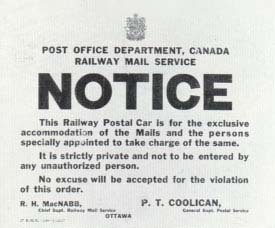 One of the most popular covers is those cancelled on board the R.P.O., over the years thousands of different cancellations tell the history of the Railway Mail Service. One of the most unique of these cancellations was that used during the construction of the CPR which read "End-of-Track B.C." Read the full story in On Track, The Railway Mail Service in Canada, by Susan McLeod O'Reilly. Visit our LIBRARY for further information. Once a piece of mail enters the postal system, the Post Office becomes responsible for its security. Postal-sorting areas are therefore limited to authorized personnel. This sign, date 1927, was posted in mail cars. When you first started out, junior meant dump, that meant the dirty job. You worked at the door, slugged all the mail in, piled it in the stanchions and dispatched it, and you also dumped the bags at the table for the people, turning it upside down to make sure you have all the registrations. Newspapers and parcels are sorted directly into non-locking "tie sacks," Ottawa district, 1938. 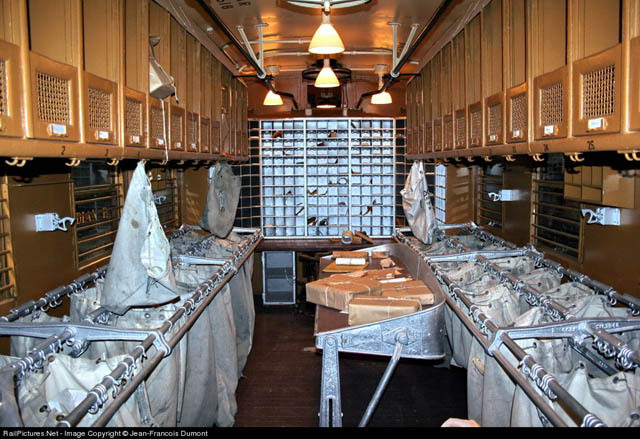 The wooden "cages" above the row of mailbags served as extensions of the bag racks. Mail clerks "threw upstairs" into these compartments. The last mail delivery by train at Coldbrook, Nova Scotia, 1956. Notice the mail clerk kicking the outgoing bag onto the ground as he snares the incoming bag from the catchpost.